The Plant and the City of Tallahassee are requesting submissions for designs to be painted on eight I-beams in the Gaines Street Art Alley. The finished designs will be featured in the City’s evolving project to beautify and green this urban space/easement, which will feature a boardwalk, rain garden, and community artwork upon completion in December 2015. Participating artists will be recognized by the City during an opening ceremony anticipated in early 2016. The I-beams are located behind The Plant at 517 West Gaines Street. Adjacent properties include St. Michael’s Pub on Gaines St., and the Crepe Vine on Railroad Ave.
You may submit more than one design, but only one I-beam per person will be accepted. 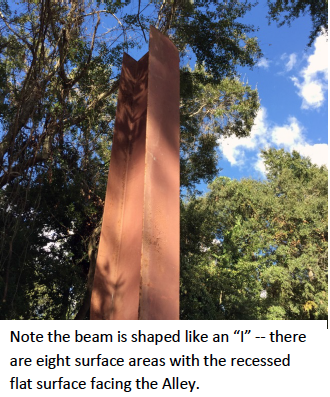 Each Ibeam is roughly 12 feet tall, depending how deeply it is embedded in cement. The width and depth are either 8” x 10” or 6” x 8.5”. Slight bending is apparent – they were salvaged from a warehouse demolition but are structurally sound for re-purposing. The main function of the I-beams will be to support lighting and temporary artworks. 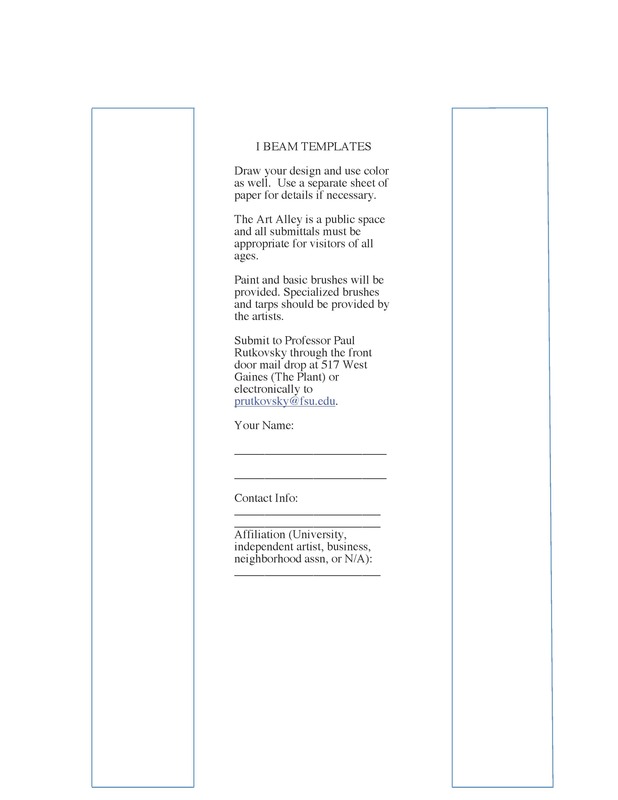 We plan to hang framed two-dimensional paintings, drawings, photographs, and prints on the I-beams during organized events in the Art Alleys. In the future we hope to include three-dimensional temporary sculpture/installations as well. We suggest that your design be as simple as possible but visually interesting of course. Our objective is to create a visually compatible yet unique experience, with a synergy between the Ibeams and the artworks.